Lincoln was booted in the face early on in the 2-0 victory at Wingate & Finchley and the reckless high challenge earned the home side's Donovan Makoma a red card. After lengthy treatment on the pitch, Lincoln bravely carried on and helped the visitors to a victory earned with two goals from the lively Mason Walsh. But the valiant custodian needed stitches to the wound caused by Makoma's studs after the game. And he took to Twitter to explain the procedure. He then took issue with claims on social media that the hosts were set to appeal against the sending-off as no injury was caused. 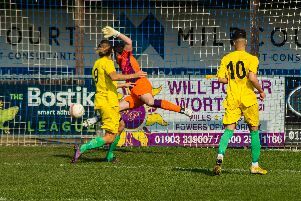 Nye Camp bosses Jack Pearce and Robbie Blake are desperate to have Lincoln back in goal for the run-in, with a Sussex Senior Cup semi-final clash with Brighton U23s next Tuesday (April 9) after the Bostik Premier League encounter. And Pearce says he is confident that will be the case having spoken to the keeper since his treatment. He said: "We remain hopeful that Dan will be with us after the unfortunate incident at Wingate & Finchley. He deserves an awful lot of credit for continuing to play and there is no question that he influenced the result hugely by doing so, and he kept a clean sheet in the process. 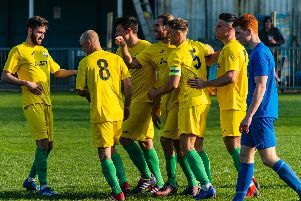 I have spoken with Dan and it looks as if he has a very good fighting chance of playing on Saturday against Brightlingsea Regent."